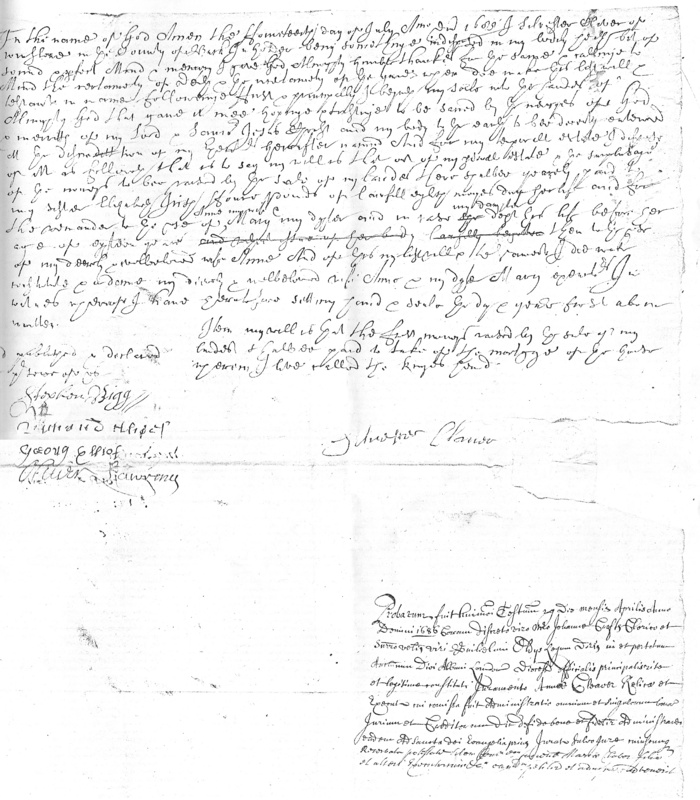 [translation] This will was proved on 29 April 1686 before the discrete man Master John Crofts, clerk and surrogate of the venerable William Oldys, doctor of laws, principal official duly and legitimately appointed in and throughout the whole archdeaconate of St Albans in the diocese of London, on the oath of Anne Cleaver, widow and executrix, to whom was entrusted administration of all the goods, rights and credits of the said deceased, to administer them well and faithfully, having previously been sworn on God’s holy gospels, not infringing anyone’s right, with the power reserved of making a similar commission to Mary Claver the daughter and other executrix, etc., when she comes to seek admission to it. A true and Perfect Inventari of the Goods and Chattells of Sillvester Claufer of Winslowe in the County of Buckes yeoman deceased tacken the five & twenty of August in the year of our \Lord/ 1685 Inpaysed and tacken by Steven Bigge and Robert Gibes as followeth. This Silvester Claver was the son of Silvester Claver yeoman (d.1681). He seems to have been baptised at Middle Claydon in 1645. The unreadable signature might be Richard Horsley, who made a mark in other documents. This King's Head is now 10 High Street (the name was later used for 26 High Street). Mary daughter of Silvester Cleaver was bap. 16 Dec 1677. She died in 1700. Silvester's widow Ann married John Hearne, and made a deathbed surrender of the King's Head recorded at the 1706 manor court.